For the second in our series of Golf Christmas Gift Buying Guides we’re taking a look at the best golf gadgets and training aids available to the market today. From rangefinders to chipping nets and putting mats we’ve compiled a list of the top presents to get the golfer in your life ultra prepared for a day on the course. Want to put the ultimate smile on your golfer’s face this Christmas? Surprising them with the latest golf technology to help improve their game is an awesome present they’re sure to love. Below are our top tech picks to help support and strengthen your golfer’s performance. The pros all have swing coaches to help analyse their stroke technique, so why shouldn’t we? The 3Bays GSA Android Golf Swing Analysis Pro will keep your golfer’s swing in check. Recording their motion and sending the relevant information, including tempo, face angle, club head speed and attainable ball distance, straight to their smart phone. Well worth the £179.00 price tag. Advances in golf technology mean today’s game is more accessible and enjoyable for players of all abilities. Golf rangefinders help to improve this by providing golfers the opportunity to better plan and execute their shots. The Izzo Golf Swami 3000 Golf GPS RangeFinder is the perfect option for those wishing to experience high tech equipment at an affordable price range. Simple and easy to use, it’s a bargain at £79.95. For the best in rangefinder technology why not trust the company who pioneered the concept. The Bushnell Tour V3 Laser RangeFinder with Pinseeker Technology is the latest edition to the Bushnell range and offers users style and function all in one package at £269.95. Also available is The Bushnell Tour V3 Laser RangeFinder with Slope Edition. For a few pounds more it encompasses all the features of the original V3 with the added bonus of accurate distances +/- 1 yard whether you’re going downhill or uphill. Yours for £299.95. If you’re looking for a rangefinder with a bit less bulk, many brands now offer the amazing technology in the simple and comfortable design of a wristwatch. Offering wearers the ultimate in style and ease. The new GolfBuddy Voice Plus GPS RangeFinder is an amazing choice that speaks to you. With over 36,000 courses preloaded into the device there’s no fees, just switch it on and be amazed at £159.95! For a sporty look try the SkyCaddie GPS Watch. Available in black or white, both options are enhanced by vibrant green lettering and trims. Offering style and function that’s suitable on and off the greens. It’s yours for £179.95. A bit higher in the price range gives you the EasyGreen WR67 GPS Golf Watch. Boasting the first ever GPS golf watch with preloaded hazards, it’s a brilliant choice at £199.95. We’ve all heard the saying “practice makes perfect.” In the game of golf perfection is a difficult thing to achieve but practice definitely helps in getting players performing to their own personal best. Below are the aids we think benefit the cause. Those new to the game of golf will gain from the Callaway Basic Training Bundle. This 3-in-1 aid is perfect for improving your power, golf swing and chipping ability for £29.95. Lee Westwood Putt Master offers an exclusive instant alignment mat, providing precise set-up that helps to ensure you sink every putt. At £17.95 it’s a steal and perfect for everyday practice. For the ultimate in putting practice there’s the PGA Tour 6 Feet Auto Return Putting Mat. Complete with hazards and a slight incline, this mat works to improve your stroke and help find consistency. All for just £24.95. 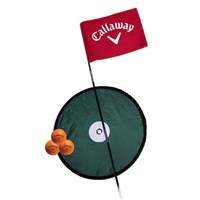 To encourage garden practice the Callaway Back Yard Driving Range offers users the perfect place to practice their wedge shots and improve distance control for only £15.95. The PGA Tour Perfect Touch Practice Chipping Net provides an indoor or outdoor target to help improve your chipping ability. This easy to fold pop-up is a wise buy for just £11.95.